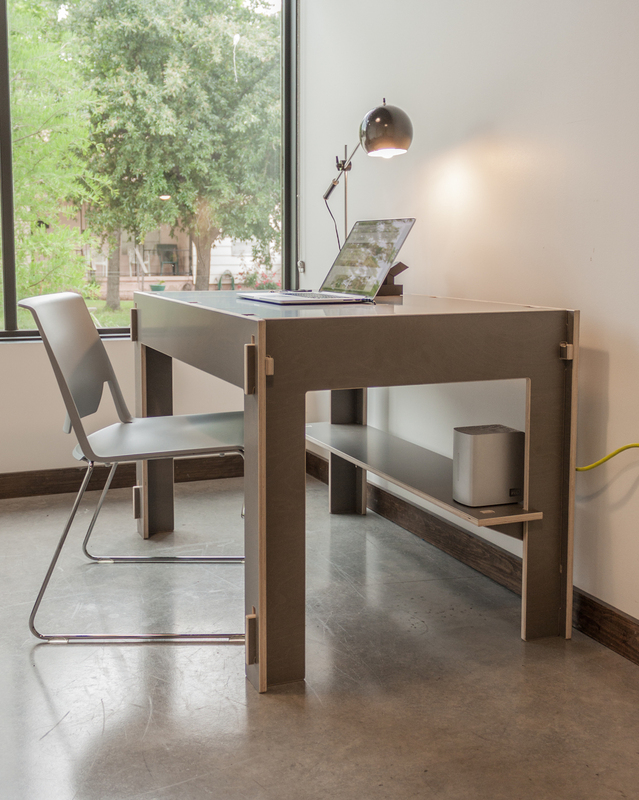 The most functional, affordable, tool-free desk for iMacs and MacBooks. Introducing the Storage-Top Desk for Mac. Quite possibly the most functional desk there is for the ardent Mac user. 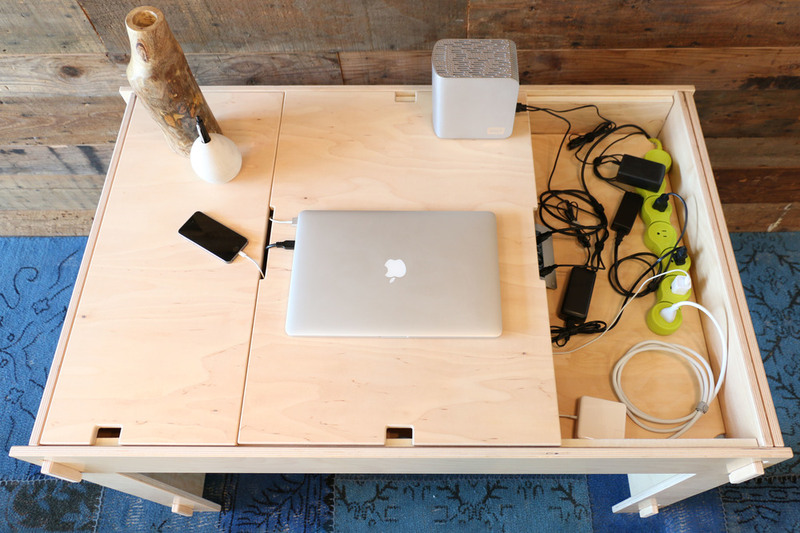 The Storage-Top Desk for Mac is a tool-free design that mimics the look of an Apple Store table but conceals a 44" x 28" x 4" storage compartment for hiding every cable and power adapter. The three movable panels can lift out and slide around on felt-lined rails for easy access to what's concealed beneath. And hangers on the ends of the table store the small panels while you're working or setting things up. Available in Natural or Quartz Gray finish. Remove one or both desktop panels. Store them out of the way on the ends of the desk. 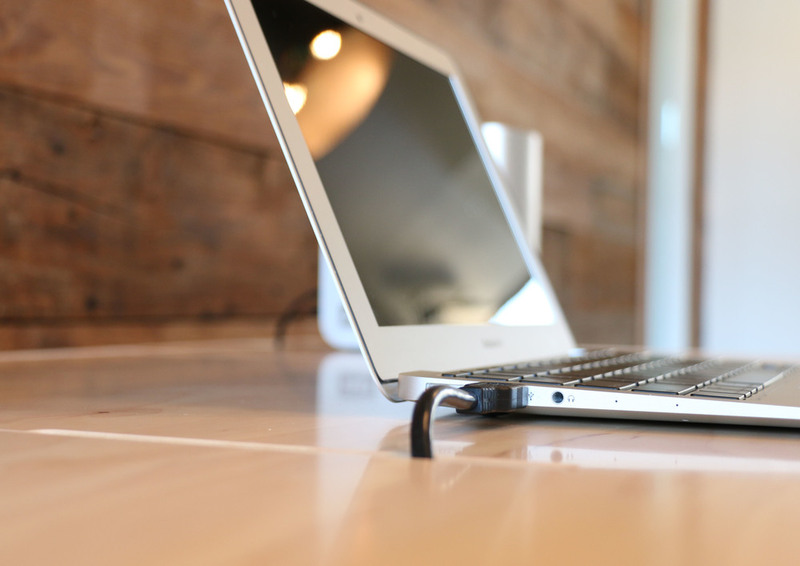 Tired of a cluttered desktop with cables and cords visible everywhere? Just tuck everything into the storage compartment and poke connectors up through the conveniently placed openings. 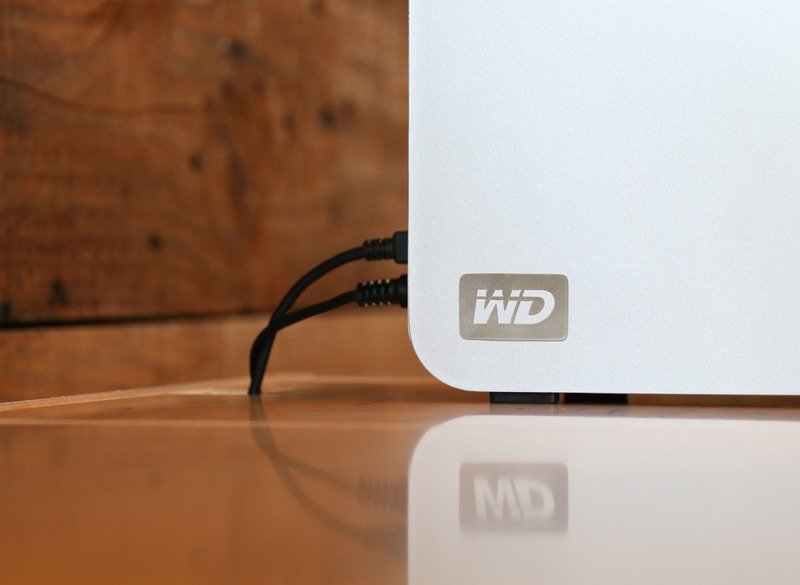 Practically the only cable you'll see will be the power cord running to your wall outlet. 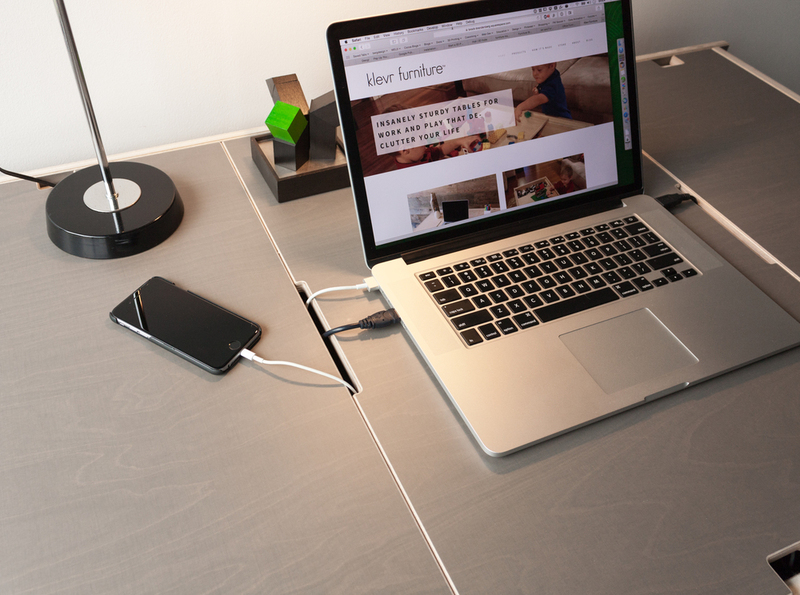 We challenge you to find a cleaner-looking and easier-to-configure desk than Klevr's Storage-Top Desk for Mac. The center panel has a notch in the back for an iMac's power cable. The side panels have slender notches that line up with the ports on a MacBook. And additional notches in the front and back align with other peripherals, plus they let you easily lift up a panel with your fingers. Because the desktop is large with a total of 46" x 30" of usable space, you can put just about any Mac setup on this desk. And the two small desktop panels are each 12 inches wide, perfect width for a document scanner or 3D printer. Below the desk, there's a full-width shelf to hold large items like books, office supplies or a printer tucked neatly away out of sight. Made from the strongest and finest plywood on earth, the Storage-Top Desk for Mac is constructed from pre-finished Finnish birch plywood. The surfaces are coated with a closed-pore film that produces a glass-smooth finish that's comfortable for hours on end. And Klevr Furniture has no sharp corners. Every edge is rounded for comfort and safety, unlike most other flat-pack furnitures that have uncomfortably sharp edges. 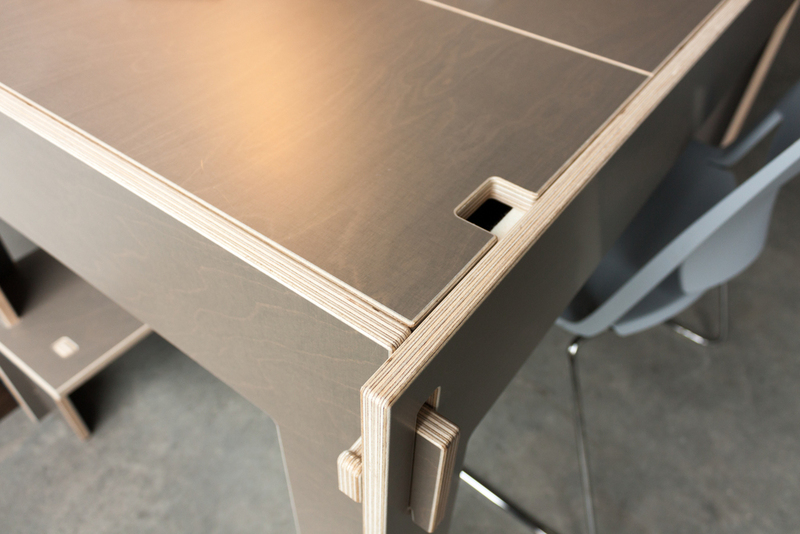 Klevr's Storage-Top Desk utilizes a tool-free design that's the result of fifteen years of experience designing and manufacturing tool-free furniture. Klevr's patented assembly method slots and snaps together smoothly and solidly. There are no press-fit joints that wear out over time or that swell-up from humidity and moisture then refuse to fit together. The desk assembles without tools in no time at all - typically, in only a minute or two. And it can be disassembled and reassembled hundreds of times without damage or wear. Klevr's tab-and-slot assembly works as well the hundredth time as it does the very first. Unlike nearly all other tool-free furniture designs, there are no thin spindly strips of material than can easily be cracked and broken, and there are no small tabs of MDF or particle board that can be broken off. 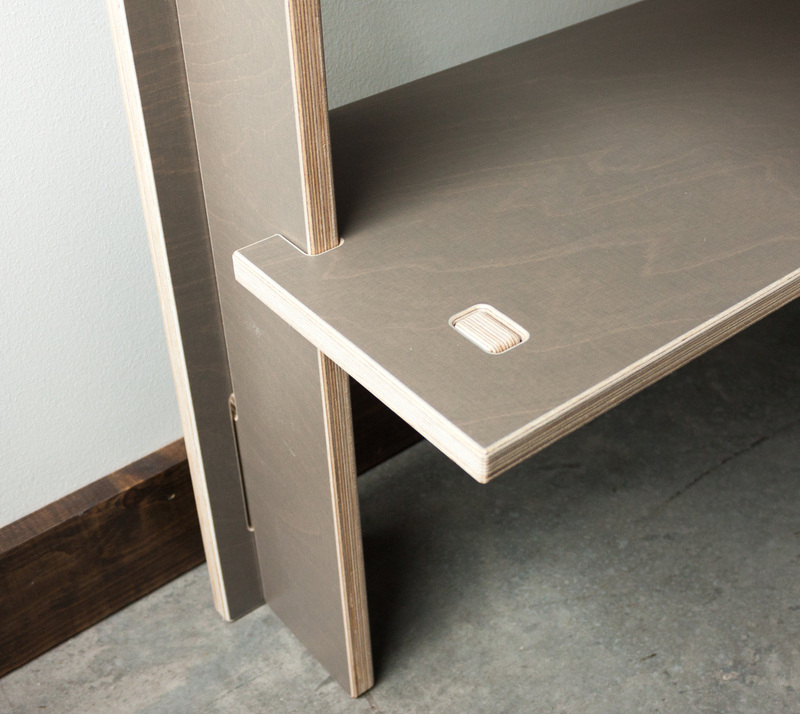 Thanks to the strength of our plywood, Klevr Furniture is nearly unbreakable. Includes the lower storage shelf. Availability: Klevr Furniture is made to order here in the USA and manufacturing time is usually 3-5 business days, barring the lack of raw materials. So unless we notify you otherwise within one business day, your order should ship on time. Mac is a registered trademark of Apple Inc., registered in the U.S. and other countries. Apple Inc. does not sponsor, authorize or endorse this site.